At some point while roaming a library, I came across a book entitled The Weekend Makeover: Get a Brand New Life by Monday Morning. It was kind of silly and I never ended up checking it out, but the basic premise has stuck with me. Each chapter focused on an area of improvement- organization, exercise, romance- and laid out a schedule to overhaul that sticking point between 5 pm Friday and 9 am Monday. The idea that one could reinvent herself over the course of two days is tantalizing but dubious. 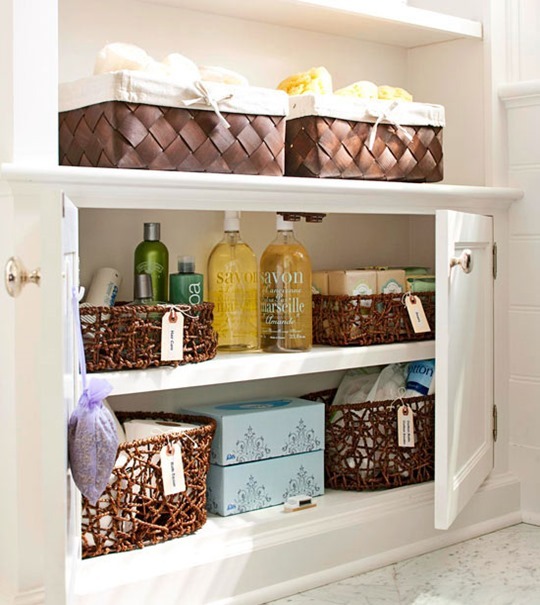 Therefore, in the pilot of what may become a regular feature if I can think of enough ideas, I’m going to suggest that there is one simple thing you can do this weekend to make your life a whole lot greener: go through your toiletries. And because it’s Friday afternoon and you just want to go to happy hour, here’s the short but sweet reason why. We’ve previously touched on the problem of microplastics in the ocean, but if you’re not familiar with the issue, it hinges on the fact that plastic does not degrade in appreciable human timescales. As plastic waste ages, it becomes brittle and breaks into infinitesimally smaller pieces. Those plastic chunks are likely to be swept away by stormwater and eventually find their way to the ocean. Remember the Great Pacific Garbage Patch? While it’s certainly true that a lot of solid trash is bobbing on the ocean’s surface, most plastic marine debris are actually microplastics smaller than 5 mm in diameter. Microplastics are broadly 1) remnants of larger plastic objects or 2) manufactured to be smaller than 5 mm. The latter category includes pellets that are melted down to make plastic items and cosmetic microbeads. If you shower or brush your teeth, you might very well be adding to microplastic pollution. Certain personal care products include tiny spheres of plastic known as microbeads that add exfoliating power to body wash, face scrubs, and toothpaste. Microbeads are swept down the drain with the used product and shuttled through pipes to the water treatment plant. Perfect, now they can be removed, right? Not so fast. 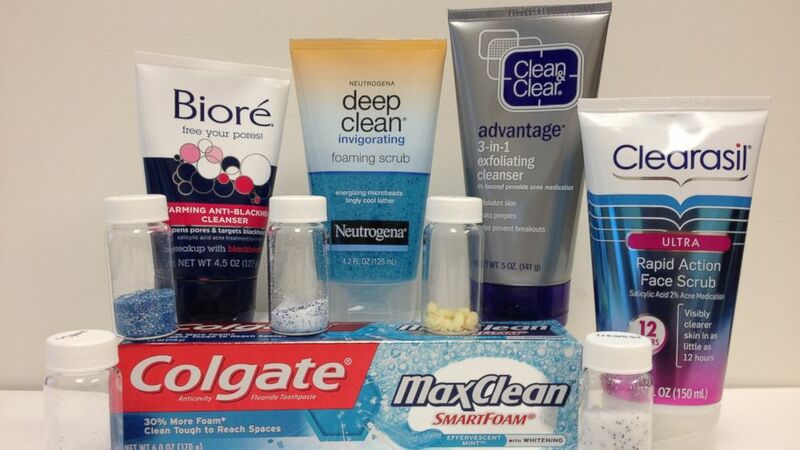 Remember that microbeads are tiny, and the average water treatment plant has no way of filtering such small particles. Undetected, the microbeads continue their journey out of the plant and into local lakes, rivers, or coastlines. You might as well squeeze your entire face scrub into the ocean, because the microbeads it contains will end up there anyway. Not only are microbeads essentially litter, but persistent organic pollutants (POPs) have been shown to sorb to microplastics. As a result, microbeads can harbor high concentrations of harmful chemicals like PCBs and PAHs. Research is still investigating what exactly happens when marine critters eat microplastics, but preliminary studies suggest that the debris can accumulate in their stomachs. Ingested microplastics may also release sorbed POPs into the organism’s system, which means those toxins can begin to impact the food chain. Those blue specks are microbeads. Last seen in your toothpaste tube? Image from http://www.greatlakes.org/microbeads. The worst part? Cosmetics companies are well aware of this. Microbeads are included in products with the full knowledge that they’ll simply be washed away with use. And washed away they are: a recent study found an average of 43,000 microplastic particles/km2 in the Great Lakes, with a maximum density of 466,000 particles/km2. Most of those microplastics were identified as microbeads. Considering that the average face scrub contains more than 300,000 microbeads, it’s no wonder that states are trying to limit offending products. Last month, California passed a bill banning synethetic and biodegradable microbeads, and other states already have laws stipulating a phase-out and ultimate ban on microbeads. Until a microbead ban becomes commonplace, you can take action yourself by sorting through your cosmetics. Products may not advertise microbeads per se, so check the ingredients list for polyethylene (not polyethylene glycol), polypropylene, poly-e-terephalate, and polymethyl methacrylate. You can also look up your product on Beat the Bead’s database or app to see if it contains microbeads. And that’s all it takes to have a greener life by Monday morning! In about 20 minutes this weekend, you can easily help your local marine or freshwater habitat in a big way. 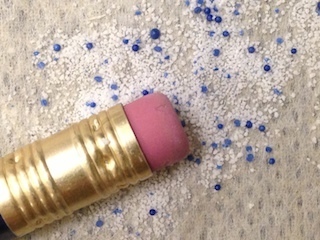 And don’t worry, passing on microbeads doesn’t mean you have to swear off exfoliating. There are plenty of products that contain natural scrubbers (a good list can be found here). Now get yourself to happy hour already! The vials contain microbeads filtered from the corresponding product. Imagine dumping those right into the lake… Image from http://abcnews.go.com/Lifestyle/york-ban-microbeads-facial-scrubs/story?id=22467638. Tags: cosmetics, Green Your Weekend, microbeads, microplastics, Sustainability. Bookmark the permalink. Previous post ← Greetings from Lake Taihu!